“Looking for a trustworthy locksmith service in Montreal and surrounding areas? You came to the right place. We will be there in 15 min and only for 15$. Local, reliable and 20 years of experience”. This is pretty much the most common search query and response in Google for the locksmith service providers in Montreal. But, is it that easy to find the great locksmith service in Montreal, with which, you will feel satisfied and secured? Unfortunately, NOT. We, at the Serrurier911 Locksmith in Montreal, are constantly monitoring the situation in the industry and ready to share some insights with you. Our motivation is to do good to the community we live in, improve industry standards and help potential clients find exactly what they are looking for. So, there are about 175 search results on Google and Yellow Pages for the query Locksmith servicing Montreal area. Whom to chose? Who would respond to the expectations of prices, quality, trustworthiness and the most important, security? Unfortunately, on the phone, without conducting the proper investigation on the company we are hiring (REQ, BSP, Industry Canada), there is no actual way to determine if this company delivers what it promises or even exists. Many mobile locksmiths do not publish their address on their websites, even though it affects the trust level. By the way, from 175 listed in Google and YP, mentioned above, only 78 are real locksmiths licensed by BSP. So it is very easy to call someone that is faking his address or doesn’t have a license. Many would suggest you to have the number of your local locksmith in your contacts. But, not all the locksmith offer a 24/7 service and can be there when you need them. So we suggest you to change the approach all together. We have nothing against locksmiths working out of their personal vehicles and wearing their regular cloves at work, but we strongly believe, that if you are dedicated to the delivery of the proper security service the uniform and insignia on the vehicle is the least that the professional could do to increase the level of trust and security. Remember, not all the legal locksmiths wear uniform and drive marked trucks. But it is most certain, that the illegal locksmiths wouldn’t. If you have hired someone for lockout, lock installation, door repair, change of combination, safe works or any other work related to your security and they show up with no uniform, no marks on their car indicating their professional designation or you feel hassled during this service process, ASK THEM FOR MORE INFORMATION. Every locksmith service operating in Quebec has to have the license from BSP and the locksmith executing the task has to have a personal locksmith license. We are obliged to provide it upon the request immediately and on the spot. THE LICENSE IS THE BEST PROOF OF ABILITY AND SECURITY. SO ASK FOR IT. 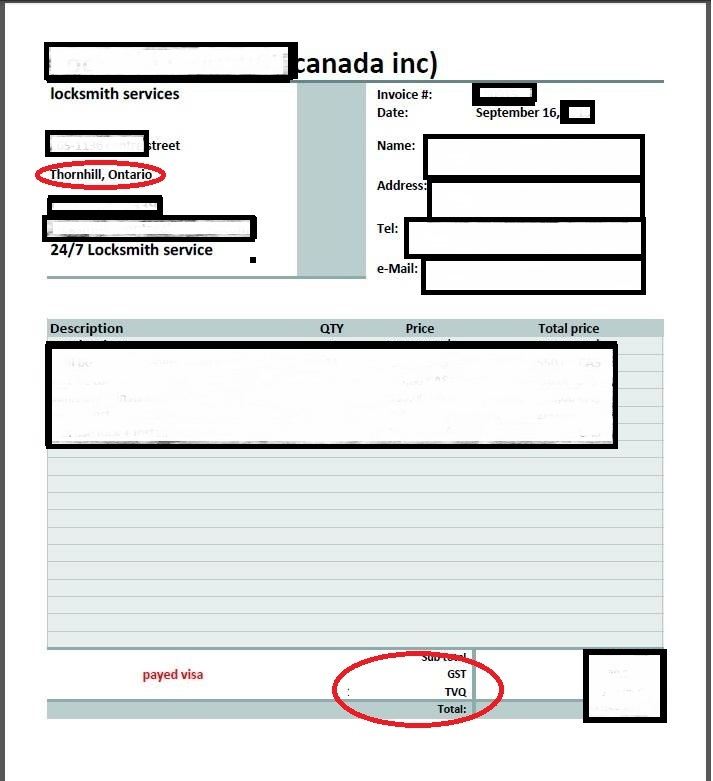 The receipt should be properly done and have all the following information on it: COMPANY NAME, QUEBEC ADDRESS, TELEPHONE, GST/QST NUMBERS. The lock is the first and main security tool of your household, or commerce, so make sure you have proper information of those who worked on it. Give us a call if you need a service or an advice.